Hold 3 slices at a time and cut diagonally to get six triangles. Keep each set of 3 separate so they fit one on the other exactly. Take the milk in a saucer. Use a cutting board to make the sandwich. Apply butter to the bread, dip in milk of 2-3 seconds. Place on the board. Spread some cheese. Sprinkle a pinch of salt and pepper. Apply butter to next slice, dip and place on first. Place cucumber slices on it. Sprinkle salt and pepper as before. Apply butter to third slice. Dip and place on second. Apply a dot of butter on top. Lift with a spatula and place on a warmed griddle. Toast the surfaces and sides till brown, turning to toast all over. Repeat for remaining sandwiches. If griddle is large many can be done at a time. Serve hot with french fries spicy ketchup and decorated with thin cabbage strips. 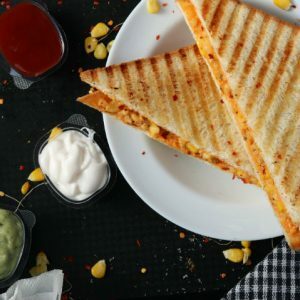 Feel free to comment or share your thoughts on this Milk Toasted Sandwiches Recipe from Awesome Cuisine.